APR is pleased to introduce the 2.0T FSI Stage III GTX Turbocharger System. Producing over 440 horsepower on 93 (R+M)/2 octane and 475 HP in racing configurations, Stage III GTX places the 2.0T FSI's accelerative performance in the same league as that of large V8 supercharged muscle cars and sub $400,000 exotic sports cars. The new APR Stage III GTX Turbocharger System represents a large leap in technology over our previously available GT Turbocharger System. The new system’s response is much quicker, spooling hundreds of RPM sooner thanks to the latest in Garrett turbocharger technology and advancements in the ECU Upgrade. Further refinement of the fueling system increases the system's reliability and drivability. A substantial increase horsepower and torque results in a large gain in the area under the curve over the previous system. As you hear a new exotic growl from your exhaust system, expect exhilarating g-force levels sure to put a huge grin on your face! To learn about many component included in the APR Stage III GTX Turbocharger System, click the thumbnails below for a larger image and technical details. 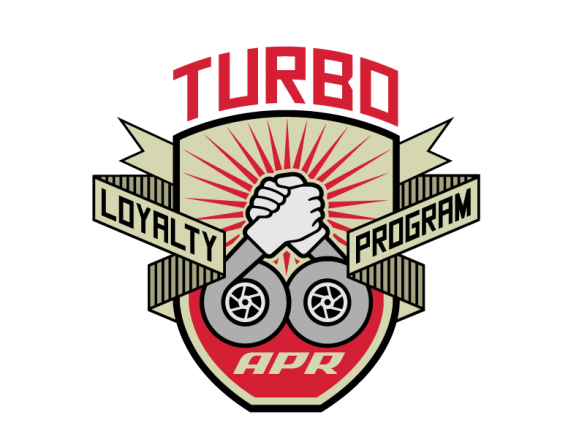 For previous owners of the older APR Stage III GT Turbocharger System, an upgrade package is available. At the heart of Stage III GTX is a GTX2867R turbocharger, consisting of the latest technologies from Le Mans’ winning turbo manufacturer, Garrett Honeywell. The internally gated unit features a fully-machined, ten-blade billet compressor wheel and a dual ball bearing oil and water-cooled CHRA. APR’s Engineers spent countless hours testing turbine inlet and A/R sizes in order to decrease turbocharger lag without negatively impacting peak power. The newly developed compressor housing utilizes anti-surge porting, which greatly complements the lightning fast spool characteristics of this unit and grants APR’s Engineers the ability to deliver massive levels of torque inducing boost pressure, even in the lower RPM range. Each manifold is investment-cast and machined in house on APR’s CNC machines to ensure high casting tolerances, repeatable results and strict quality control. The thick casting material reduces unwanted exhaust noise leaving behind a powerful and exotic growl. With the significant amount of changes included in the APR Stage III GTX Turbocharger System, APR’s Engineers spent months recalibrating the engine management system to operate smoothly as if intended by the OEM. Thanks to APR’s incredible proprietary calibration suite, data logging software and full access to the coding structure of the ECU, appropriate and intelligent changes are made to ensure flawless drivability and excellent performance without compromise. Wire reinforced, multi-ply silicone hoses provide an unrestricted path for airflow to enter and exit the turbocharger at over 1,000 kilograms per hour. The ultra rigid design ensures boost and vacuum piping will not swell or collapse causing leaks and restrictions in the induction and charge piping system supporting boost response and turbo recovery. Each hose is engineered to fit properly into the 2.0T FSI engine bay with all necessary emissions and reference ports securely affixed. To provide unrestricted and smooth airflow from the turbocharger to the intercooler, the APR Stage III GTX Turbocharger System includes a cast enlarged turbo outlet pipe to properly deliver the additional airflow from the larger turbocharger. The 2.0T FSI's engine management relies on load calculations to accurately control the engine. Calculations are made by measuring airflow across the Mass Airflow Sensor and this is a critical component of the APR Stage III GTX Turbocharger System. The small and restrictive factory unit is removed and replaced with the much larger housing. To ensure accuracy, APR’s MAF housing is cast in the United States of America and CNC machined in house at APR to ensure repeatable results. The long, precision-machined housing features a honeycomb airflow straightener to further aid in accurately reading airflow levels. Simply enlarging the MAF housing is not permissible without accurate adjustments to the factory engine management system, which is included with APR Stage III GTX Turbocharger System. APR’s oil and coolant lines are specific to the 2.0T FSI Stage III GTX System and provide years of leak free operation. The oil lines feature flexible braided stainless steel with CNC mandrel bent hard-lines for specific and clean hose routing as if intended by the OEM. The factory 2.0T gasoline direct injection injectors require higher than factory fuel rail pressure to achieve targeted air fuel ratios under high load, wide open throttle operation. APR’s Low Pressure Fuel Pump delivers the desired volume of fuel to the APR High Pressure Fuel Pump, which provides increased fueling headroom over the factory unit. However, the factory High Pressure Fuel Rail Valve limits maximum rail pressure below the desired level. The included APR High Pressure Fuel Rail Valve is calibrated to increase the maximum rail pressure to levels necessary for proper operation. In doing so, APR’s able to support far higher horsepower levels than achievable on the existing APR Stage III GTX Turbocharger Systems without the need to alter the OEM correct-spray-pattern injectors. This results in smoother part throttle operation, factory-like cold starts and fewer unburned hydrocarbons emitted from the tailpipe under all conditions compared to other fueling options. Every APR Stage III GTX Turbocharger System includes all necessary components for a complete install. No matter how small the part, each piece of the APR Stage III GTX Turbocharger System oozes with quality evident in pieces like the Stage III GTX's laser cut ancillary brackets and carriers. Proper temperature range spark plugs are included with each APR Stage III GTX Turbocharger System. The APR HPFP is required. APR cannot make any guarantees as to the longevity of the OEM manual transmission clutch or DSG/S Tronic clutches in every transmission and therefore an upgraded clutch, such as APR's upcoming DSG Clutch Packs, are recommended and may be required depending on the stage, octane, driving style and clutch health. *Software will not be made available without owning an APR Stage III GT2871R Turbocharger System.